PM Netanyahu meets Mexican diplomat fired as Ambassador to UNESCO after refusing to vote for anti-Semitic resolution. Prime Minister Binyamin Netanyahu met Monday with former Mexican Ambassador to UNESCO Professor Andrés Roemer in Paris, and thanked the ambassador for his courage and the personal price he paid to defend the truth and the history of the Jewish people. Roemer was appointed the Mexican Ambassador to UNESCO in April 2016. He was fired from the position just two months later after he refused to vote for an Arab resolution denying the Jewish connection to the Temple Mount and the Western Wall. Although his government instructed him to vote in favor of the anti-Semitic resolution, Roemer refused to do so. Instead he got up and left the hall. His deputy took his place and voted for the Arab resolution. Roemer was put on disciplinary trial and dismissed for his action. During their meeting, Professor Roemer gave Netanyahu a copy of his latest book and the prime minister promised to read it. Half an hour after the end of the meeting, Netanyahu could already relate to selected quotations from the beginning of the book. 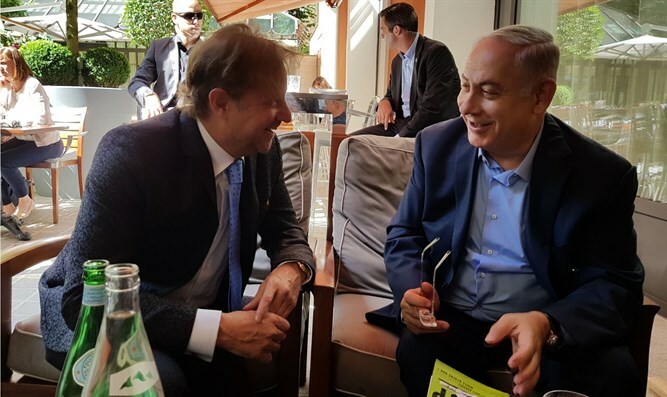 "The past year has been very moving, because usually there is a tendency to forget things within moments, but here it is not only the Israeli ambassador who remembered me and arranged the meeting, but the Prime Minister of Israel who saw fit to find the time to do so," said Roemer. Israel's ambassador to UNESCO, Carmel Shama Hacohen, who initiated the meeting, said that "finding time for a private conversation with the prime minister is a rare achievement for every ambassador. It is especially vital to the Israeli ambassador to UNESCO [myself, whose meetings] deal with the strategic decisions which are made in Israel by the Prime Minister." "Despite this, I found it necessary to give up part of the time [allotted for my meeting] and asked the prime minister to meet and express our appreciation for Andrés' courageous and moral step. And the meeting was both moving and riveting."